Our solution introduces innovation and improves the passenger experience in an outdated process that produces dissatisfaction. Doing so, we generate ancillary revenues for the airlines and for the airports, and improve the airport efficiency, the flow of passengers and eliminate the hassle inside the cabin. Sometimes we have all suffered the inconvenience of having to manually check the carry-on baggage, trying to make it fit inside the sizer (metal box). That process involves significant loss of time and image for the company and currently accounts for 80% of airlines complaints (IATA Survey Customer Experience 2015). Today the carry-on baggage check-in process is the direct a great problem for airlines because is directly responsible for the most of flight´s delays. 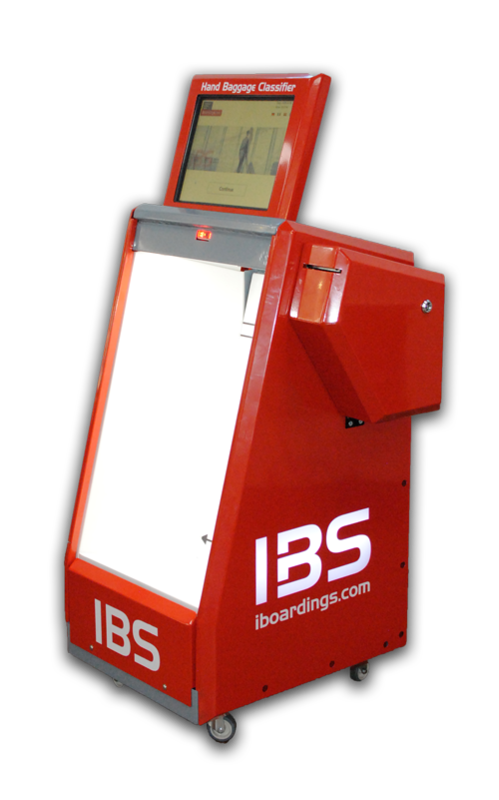 Why the iboardings kiosk is the right option? The best way to manage the hand baggage problem. Improve your passenger experience, the airport flow, the OTP and increase the ancillary revenues. One type of kiosk for developing differents works. Serve also as prior step to self bag drop. Provide more options to self bag-tag printing at iboardings kiosks. The "1st step"prior to self bag drop. "Speed up" the self bag drop process. Support bag-tag printing via airlines DCS´s. 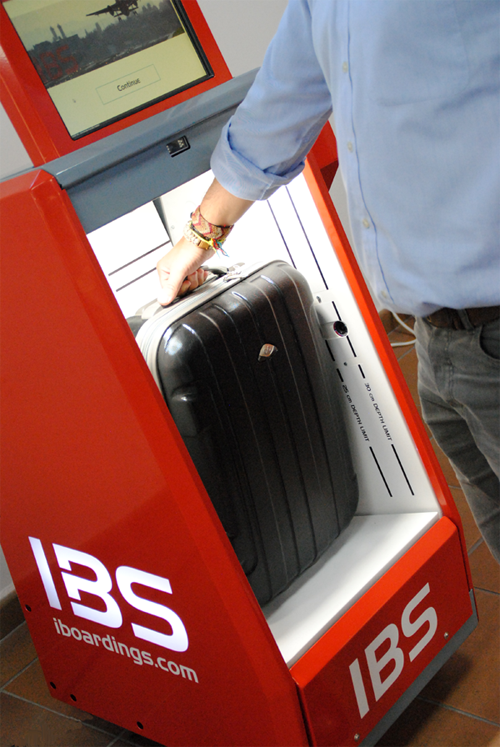 Serve as a tool to solve the hand baggage problems at gate. Make the payment process at the kiosk. Weight and size analysis of checked baggage and hand baggage. Alleviate the stress of baggage collection. Help to collect the gate bag fee introducing a payment platform. Record baggage figures for flight. Eliminate the time moving hand baggage sizers. Improve the handling agent experience as well. Diminish the number of hand baggage at gates. According to the IATA figures, the air travel is likely to double over the next twenty years and as a consecuence airlines and airport has to manage an increasing number of passanger that demand for doing the journey more comfortable. There are permanent complaints about the process inside the airports during the check-in, security check, and boarding phase. Around the world, airlines and airport are being pressured to take the passenger into account and to generate new ways of doing these processes quicker and comfortable, improving the passenger experience. Becoming an important mechanism for generating ancillary revenues for the airline. Permit to eliminate the metal box from all the boarding gates and help to generate revenues for the airports and airlines. During the passenger flow in the airport, one of the most disturbing phase is the boarding proces, above all, the moment when a handling agent want to veryfied if your carry-on bagggage is compliant or not compliant in relation to the company policies. At this moment, the process is subjective, It generates problems with the passengers due to the subjectivity. Random controls. The size verification is performed randomly, not for every passenger. Innefficient. Introducing the hand baggage inside the gauge is time consuming.It generates hassle onboard. The actual method generates hassle inside the cabin, due to that it is possible that sometimes there will be no room inside the cabin for the hand baggage.This situation is always rated like the most important one for the passenger satisfaction during the boarding process. Nowadays all the airlines have a problem with the management of hand baggage and passenger satisfaction during the boarding process.